February 26th 2016, I was very pleased to receive a Volunteer of the Year award from the Winnipeg Chamber of Commerce at Brian Bowman’s State of the City Address. While it’s great to be recognized for the work that I’ve done, I’d like to mention how much the Winnipeg Chamber has done to help my business grow. In part, ok mostly, I was recognized for all the Winnipeg Chamber of Commerce directories I delivered. However, this wasn’t just drudgery, hauling around directories and leaving them in mailboxes. This was an opportunity to meet business owners from different parts of the city that I hadn’t yet met at a Chamber event. I stopped at every location, identified that I was a volunteer Ambassador with The Winnipeg Chamber of Commerce, here to deliver the directory. I asked if I could speak with the owner to say hello and tell them about my business. Not only was this a benefit to the Chamber, I was edified as an Ambassador and CostWise Business Consulting generated business. 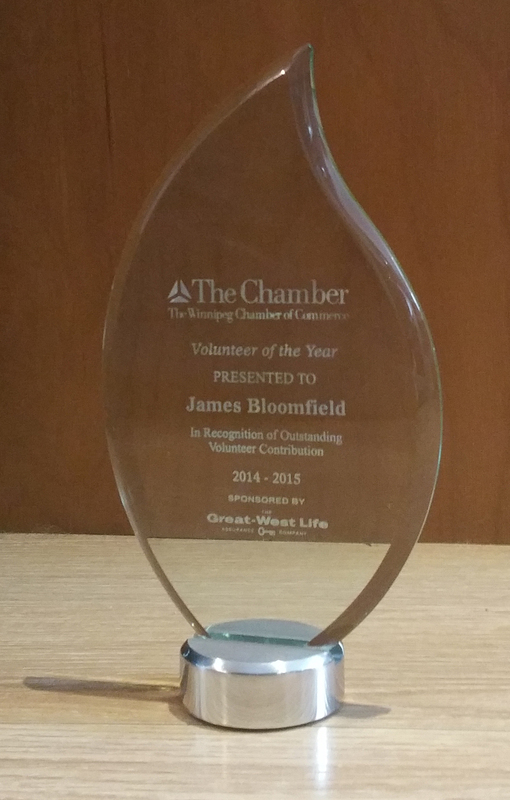 So, I guess I’ve turned this award into a promotion for the Winnipeg Chamber of Commerce. It seems appropriate to end with a call to action in that line. If you’d like to learn how to become more involved in the Chamber or would like to find out about joining and what the benefits are, feel free to reach out to me and ask. I’d be happy to share.